This mountain in Ecuador, which is known locally as Mama Cotacachi, used to be capped by a glacier that was a dependable source of ice and water for nearby communities. Florent Figon/Flickr. Republished from SAPIENS. As many glaciers throughout the world are retreating at faster rates, they have become powerful symbols of global warming. But glacial retreat is still an abstract idea for many people, which makes it easy to ignore. As environmental historian Mark Carey puts it, “Most people in the United States have never encountered a glacier; nor would they be able to identify one even from close proximity.” Yet due to global interconnection, our actions have far-flung consequences—in unfamiliar landscapes and in places we cannot see. In communities from the Andes to the Alps to the Himalayas, glacial loss affects people’s lives in concrete ways. In Ecuador, when the last ice crystals from Cotacachi’s glacier melted, a once-reliable source of water evaporated. According to farmers in the area, it also doesn’t rain as much as it used to, Rhoades and his co-authors wrote in Darkening Peaks. The combined effect of less rainfall and drier rivers and streams has made agriculture more challenging, as multiple consequences of climate change intersect. This global inequality is one of the greatest tensions at the heart of climate change. 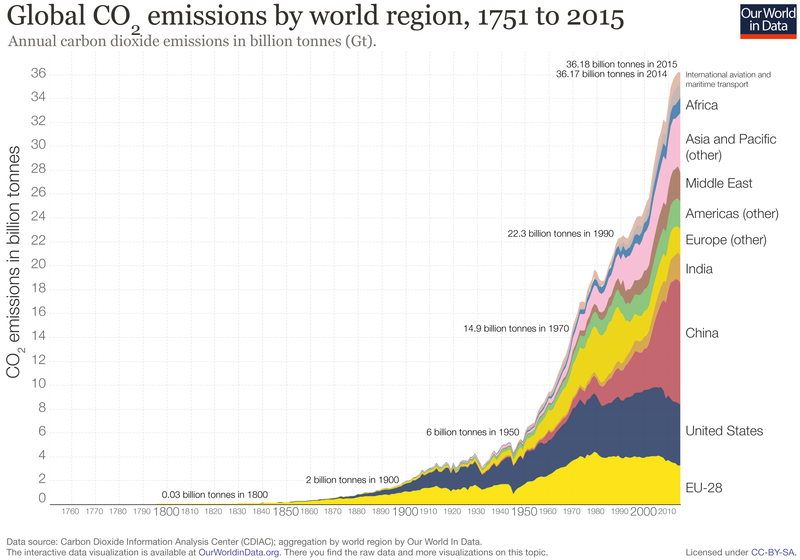 According to data from the World Bank, for example, while the United States emitted 16.49 metric tons of carbon dioxide per person in 2014, Ecuador emitted 2.76 metric tons per person. Because the United States and many countries in the European Union have historically emitted a far greater global share of carbon emissions, representatives from the global south have argued that they should also bear greater responsibility in responding to global climate change. As for the communities that live near glaciers, is there anything they can do? There is no equivalent of a tree-planting campaign to respond to glacier loss. Even so, in the Alps, some communities have covered parts of glaciers with synthetic fleece blankets and foam—but while such efforts may slow glaciers’ retreat, they can’t stop it. What about the rest of us, then—those of us who may never see a glacier, but whose lifestyles are contributing to global warming? How should we respond to communities who are losing the glaciers they have lived with—and, in many cases, depended upon—for centuries? What steps will we take to reduce greenhouse gas emissions, and to hold our public officials accountable? These are just a few of the many difficult questions that we should be asking ourselves. Meanwhile, the glaciers keep melting. Dana J. Graef is an environmental anthropologist who studies environmentalism and globalization in Latin America. She received her Ph.D. from Yale University and is currently a visiting scholar in anthropology at Brown University. She has taught courses on the anthropology of climate change and what it means to be “green.” Graef has published essays and articles on topics such as mining, wildness, and cultural diversity.